Does anyone else struggle with holding your kids accountable for reading their guided reading chapter books? Or what about keeping them focused on a strategy while reading their assigned chapters on their own? These are two of the biggest issues that I face with my guided reading groups. To help with this problem, I started using trifolds to help keep my kids on track while they went back to their seat to read on their own. These have proven to be really helpful for my kids in so many ways. They now know exactly what to focus on when they are reading, they have opportunities to record their thinking, and we are able to have meaningful discussions about our reading when we meet as a guided reading group again. This is something that I've learned over the years while teaching guided reading. Instead of changing the focus every chapter of the book, decide on a specific strategy to use for the majority of the book. This is less confusing for the kids and helps them focus on using the strategy over an extended period of time. Find a book that really lends itself to the strategy/skill that you are teaching. For example, in one of my groups we are focusing on inferring character traits. I thought about which book would really lend itself to teaching character traits and decided on Because of Winn Dixie. In this book, you really get to know the characters and there are lots of different traits that can be used to describe each one. A great way to do this is to use think-alouds. I love to read books aloud to my kiddos (during our reading workshop minilessons) and think-aloud for my students. It really models the thinking that goes on while reading. Before having the kids practice the skill independently on their own using the trifolds, allow them many opportunities to hear you think-aloud and to discuss their own thinking as a whole group. Once students understand the skill/strategy that you are teaching, you can have them try it independently using the trifolds in guided reading. Do you have times in guided reading when you ask the group a question (What is a summary of this chapter? How would you describe Winn Dixie?) and all you get is blank stares? Ahhh!! It drives me crazy! These trifolds allow you to have meaningful conversations with your students using the writing that they recorded while reading independently. Instead of the blank stares, students are looking at their writing and sharing their thinking with others in the group. This is so powerful! I always encourage each student to use evidence from the book to support their thinking (see the example below where a student referred to a part in the book and wrote down the page number). This makes discussing each chapter so much easier! 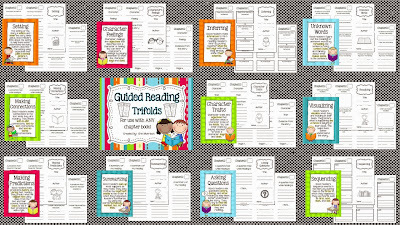 If you are interested in learning more about using guided reading trifolds, you can check out the product below that includes trifolds for 11 different strategies (character traits, character feelings, inferring, questioning, summarizing, making connections, making predictions, setting, unknown words, visualizing and sequencing). The download also includes posters to use while teaching each strategy. Just click on the picture below to see more views of everything that is included!